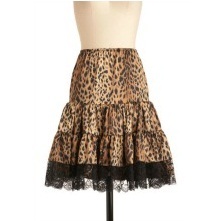 Kick up the volume on your dance party duds with this satiny Cheetah-print petticoat, found only at ModCloth. The secret to a perfect night of dancing is having a fabulous skirt to spin and twirl along with you! Just wear this black-lace-trimmed piece beneath your favorite A-line look to create a beautiful bell shape that’s as bouncy and vivacious as you are! Wear this petticoat alongside a jazzy circle skirt, a tucked-in ‘80s tee, neon socks, and your favorite hi-top sneakers, and you’ll be singing a happy tune! Shell: 97% Polyester, 3% Spandex. Tulle: 100% Nylon. Fabric provides stretch. Elasticized waist provides approximately 9 inches of stretch. Hand wash cold. Do not bleach. Hand dry. Low iron.